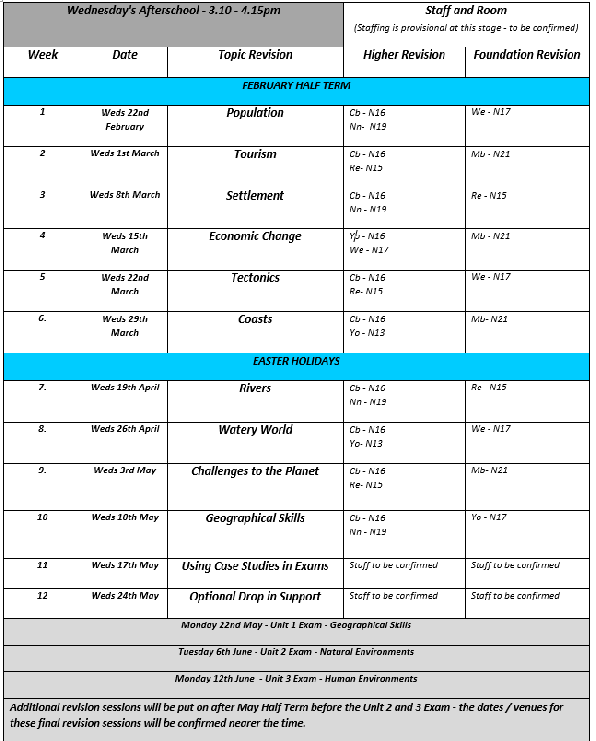 The Geography Department are running a comprehensive revision programme to support Year 11 Geographers in working towards their target grades. Due to the content heavy nature of the specification there is less time than usual for revision in lessons. Therefore to ensure every opportunity is provided to support students we are running an afterschool programme on Wednesday's after school from February - May. We would like to strongly encourage as many students as possible to attend. To provide support tailored to each level there will be higher and foundation classes offered. Students should bring their revision guides. Opposite is the revision programme setting out details of the date, location and focus for each session. Additional revision sessions will be put on after Half Term before the Unit 2 and 3 Exam - the dates / venues for these final revision sessions will be confirmed nearer the time.